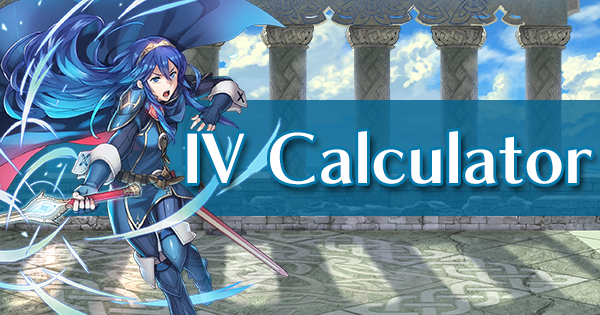 Skill Inheritance is the way to teaching your units several new abilities that they normally cannot learn on their own. For example, let’s take Azura here and see what she knows. Without Skill Inheritance, we would be done right here. She wields a Sapphire Lance+ and supports with Sing. Her passives are Speed +3 and Fortify Res 3. She even has on her Speed +1 Seal on. But what about her empty Special and B Passive? Will they remain blank forever? We are now ready to inherit some skills! Let’s find her a B Passive that suits her. I am partial to Vantage because I want her to surprise any attacker who thinks they are about to win the fight. So I need to find a character who can already learn Vantage. I decided to use Lon’qu – Solitary Blade to teach Azura a thing or two about Vantage. As you can see, I cannot skip straight to Vantage 3 and must first acquire the ability to Learn Vantage 1 and 2 before obtaining Vantage 3. And Lon’qu, himself, has not yet learned Vantage 1. 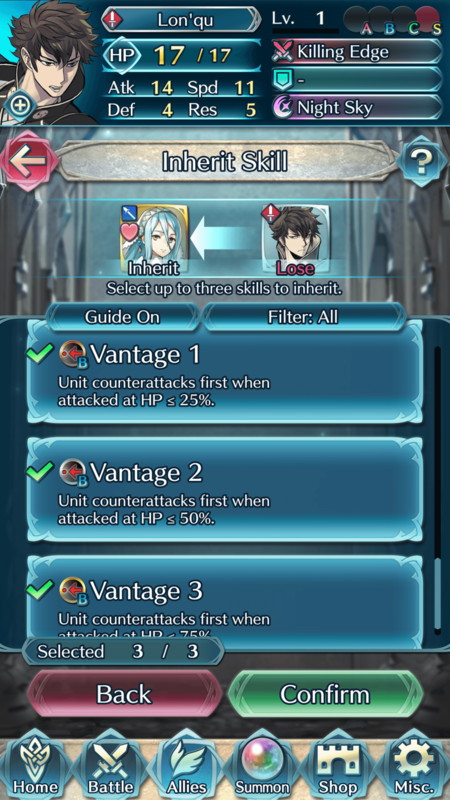 Thankfully, we can learn up to 3 abilities from a single unit regardless of their accomplishments in training, so I will select all three Vantage tiers and hit Confirm. Now if everything went according to plan, I can learn Vantage like Lon’qu. Let’s see! Voila! 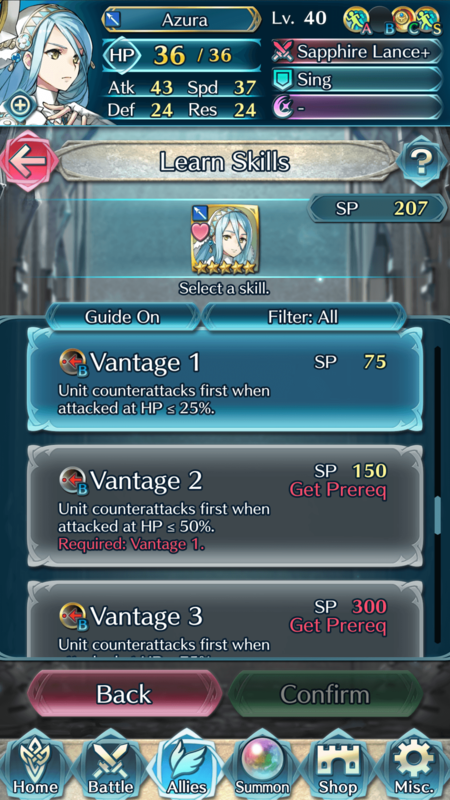 Azura can now learn Vantage. It’s important to note that inherited skills require 50% more SP to learn. 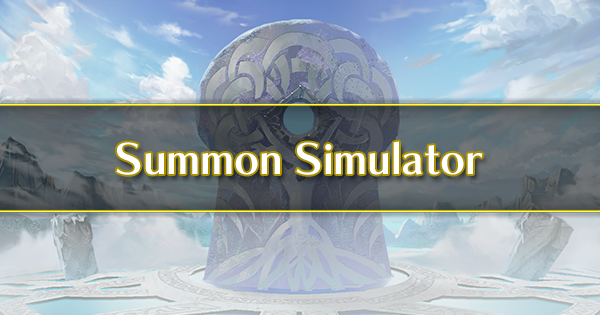 Lon’qu would take 350 SP to master Vantage, but Azura needs 525 SP before she can show Lon'qu a thing or two. 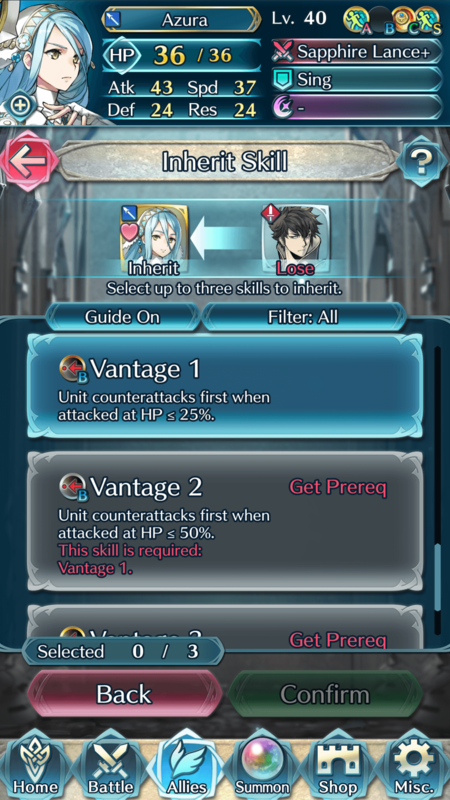 Now that you know what Skill Inheritance is, you are ready to learn what to do and what not to do. 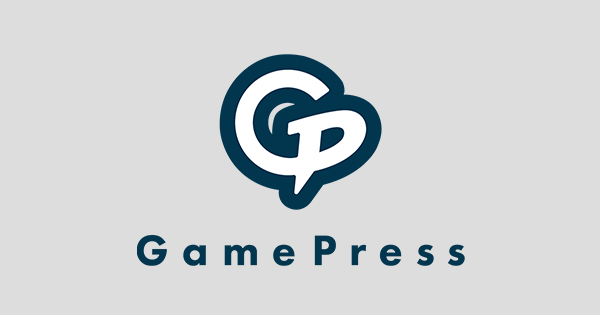 DO – Plan out your character’s setup in advance. 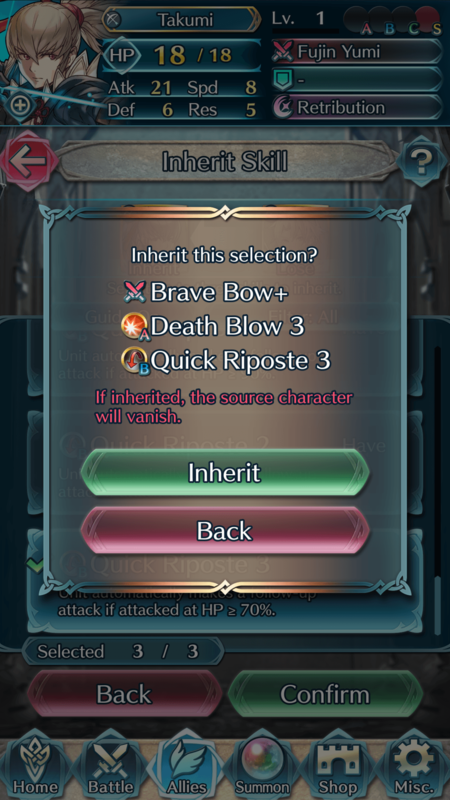 Make sure you have the units ready for them to inherit from, or inherit ahead of time to make sure you don’t use those units somewhere else. 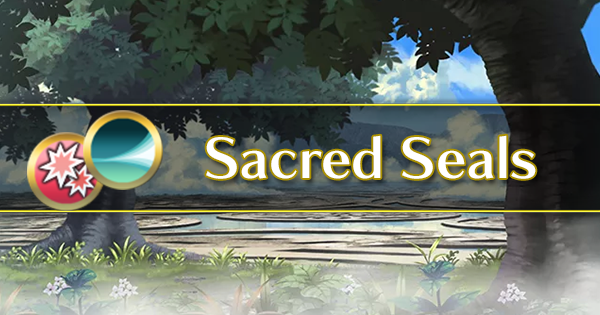 Also, save their SP for the abilities you plan on having them inherit. DO – Mark units that you do not want to lose by “Favorite”-ing them. 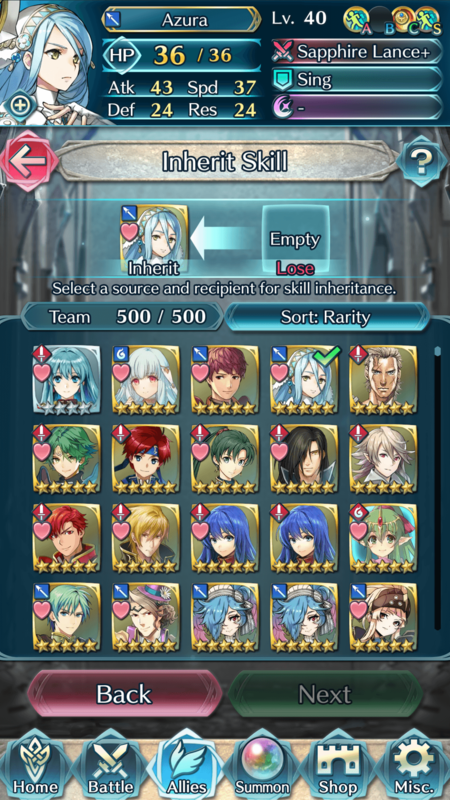 You cannot inherit a unit that is one of your favorites. 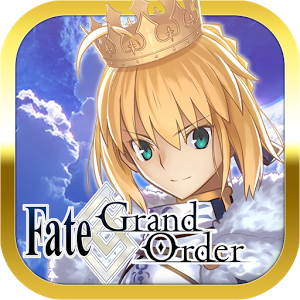 DO – Spend as much time leveling up slowly to maximize Skill Point gain while minimizing both exp gained and stamina used. 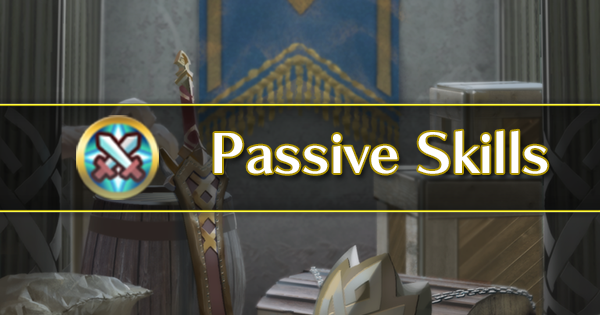 At level forty, it takes 9 stamina to give a unit 9-15 skill points. 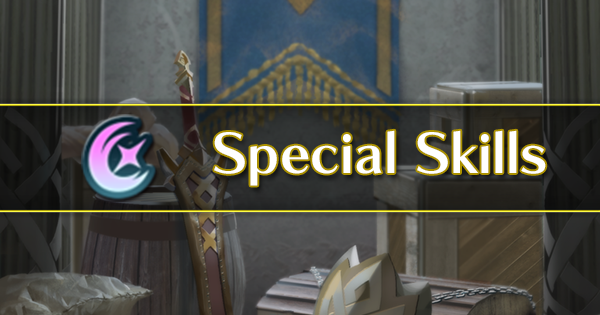 At level one, 9 stamina can give a unit more than 108 skill points. DON'T – Use your SP on native abilities that you do not plan on using later. It is a waste of Skill Points and will require an immense amount of stamina and time to make up for the deficit. 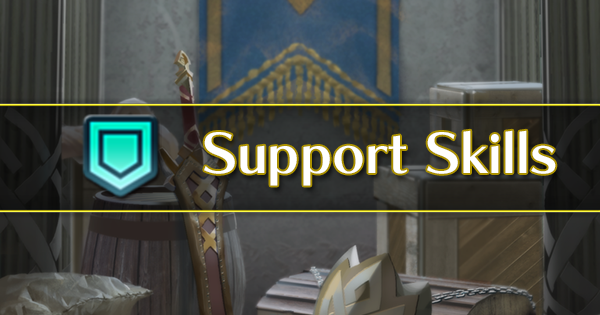 DON'T – Send any units home. 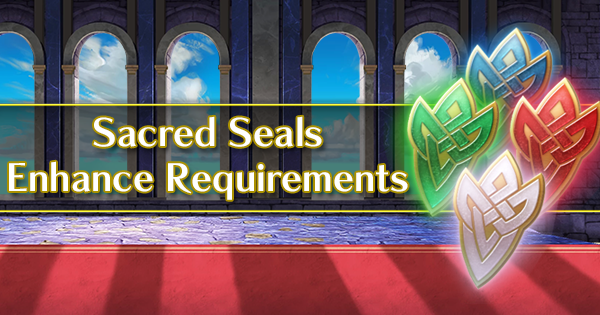 Feathers are nice, but each unit is worth up to five orbs. 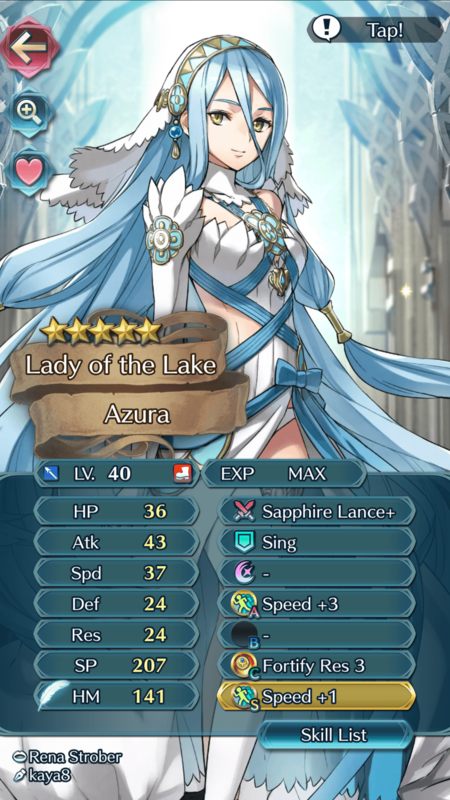 The meager amount of feathers is not worth the potential loss of an ability for a unit. Almost every unit can contribute to another unit down the line. This fact is especially true for those with a budget or do not spend money on the game. 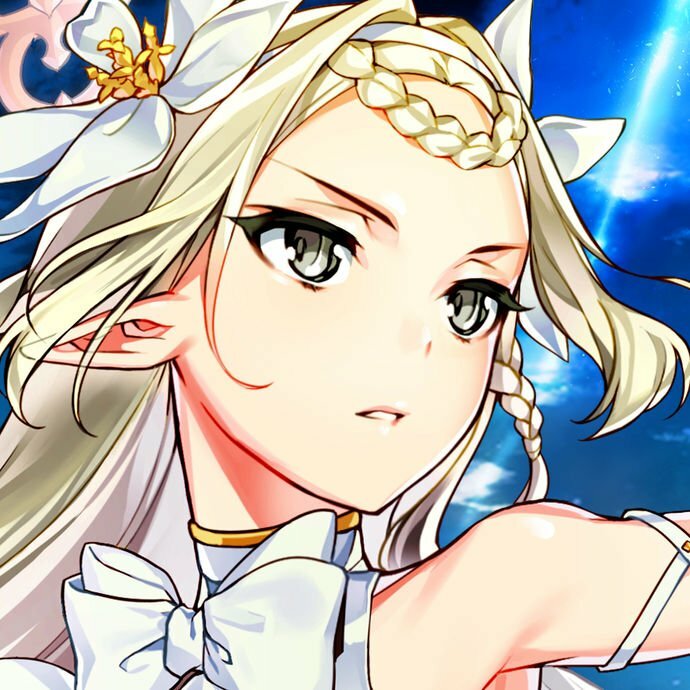 DON'T DON'T DON'T – Inherit from three star units. 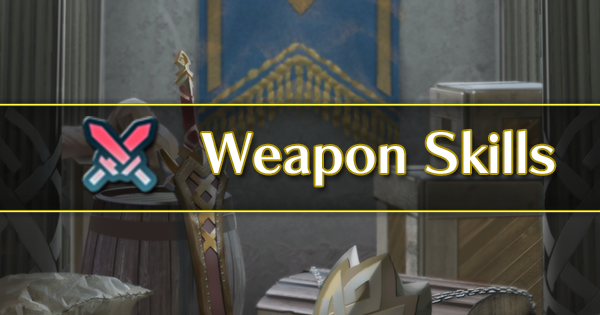 Aside from support skills, three stars rarely, if at all, offer the final level of a weapon, ability or passive. There are exceptions to this rule (like in the one below). Brave Lance, Brave Lance+, Night Sky, Astra, Galeforce, Triangle Adept 1, 2 and 3—that’s over 8 abilities to learn. How can I teach them all to him from one Cordelia? Well, you can’t. 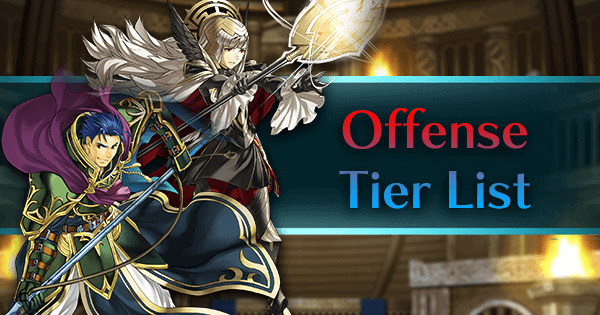 But you can teach Brave Lance, Night Sky, Astra, Triangle Adept 1 and 2 through other units that might be lying around. You don’t have those units? That’s hard to believe since both Donnel and Virion are given to you for free. 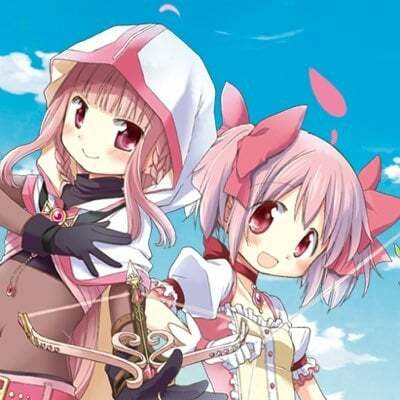 And the super-common Selena or a second Cordelia can teach you up to Triangle Adept 2 without being a five star. 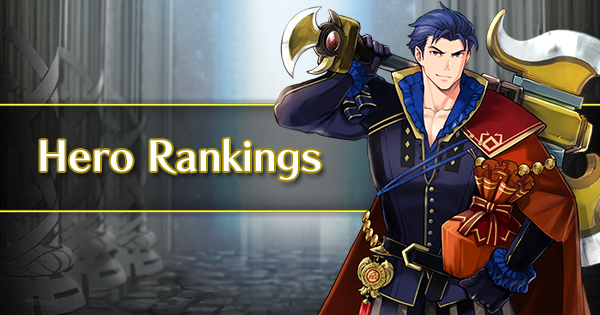 Even if you only have a three star Virion and a four star Donnel, you can teach Ephraim Night Sky and Brave Lance allowing him to pick up Brave Lance+, Astra and Galeforce from your precious Cordelia. That’s really all I have on the matter of Skill Inheritance for now. I’ll leave you with the biggest DO of all. 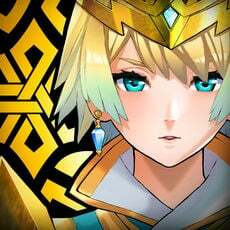 DO – Inherit skills to the max!